Are you in favor of this defensive philosophy? Firstly, as teams run progressively more actions to generate open 3-pointers, other defenses can easily be exploited. Go under the screen and you give up an open 3. Fight through it and you expose yourself to shooters stopping on a dime, pulling up, and drawing a shooting fouls behind the arc ICE is an option in some areas of the court, but it exposes you to pick-and-pop opportunities. Hedging can work sometimes, so can showing, or zoning up. This is the crux of why switching has become so popular. With point guards now able to hit 3's at a good clip in the pick and roll defenses that don't defend this are bound to fail. Switching immediately prevents that initial open look and that's why it's used so much in the modern nba. I'm also a firm believer that offenses perform better when everyone is involved. Switching screens on defense usually forces offenses into one on situations where the off ball players stand and watch. Any defense that makes it more likely the opposing team will stop moving the ball is a good one. For us less than informed posters, would you please provide us with a quick over view of this tactic so we can respond better? He's referring to defense against an on the ball screen otherwise known as a pick and roll. Since the offensive screener is preventing the on ball defender from sticking with his man the only way to defend the pick and roll is with a team scheme. Switching refers to the on ball defender, and the defender of the screener switching assignments so that the ball is never unguarded even if a screen is properly set. Let me know if that is a good explanation. If not I can try to clarify. 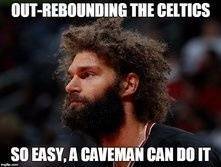 Personally, I'm not a fan, as I believe that implementing this strategy can too easily be countered, creates too many mismatches with little to no effort, only further exacerbates our already pathetic rebounding performance, if that's even possible, and has also been heavily, and intelligently, exploited by Cleveland during every single one of our games against them over the last 2.5 seasons. Ugh. Don't get me wrong, I full well recognize that the NBA is a copycat league and that said defensive strategy has worked in the past for the Showtime Lakers and Jordan's Bulls, albeit mostly during the latter's second three-peat with Harper, Jordan, and Pippen, with the Warriors being its latest success story, if you will, but I'm just curious to see as to where everyone comes down on this issue. Oh sure, that Kareem was great on switches to cover guards, LOL. I don't know why teams dont ice picks more actually. With how good guard play has become and with the lack of skilled big men, wouldn't teams want to blow up the PnR and get the ball out of guards' hands more? Granted, bigs would have to work harder but it does seem the most effective strategy, in general, no? You have to have guys who stay in front of their man and are athletic for it to work best. Sometimes those rebound matchups work in our favor too. When our Center gets on a guard if gives him a better chance to outrebound him. Yes, if you have a one-of-a-kind player such as Draymond Green, it's pretty effective. Otherwise, you just look like a fool -- which is mostly what happened to the Celtics last season. And, judging by the results, all those great "rebound matchups" didn't quite work for us. We have the personnel to do so effectively, so yes. Actually, a more accurate way to put it would be that we don't have the personnel not to. Switch everything except leave Smart on Porzingis. This is why you're seeing DA get guys who can defend multiple positions and are similar size or skill sets. Might be part of the reason of the IT trade. While Irving isn't a better defender, if you can get him to consistently he can guard 1's and 2's. Were most 2's just rise up over IT. Guys' who can guard 3's and 4's.- Hayward,Smart,Brown,Tatum,Morris,Semi. Question on Yabu and Theis. But you can see more guys who can guard 2-4 more than ever now. Those are the active guys on the floor, so you need versatile defenders at the same time. "My guess is that an aggregator of expert opinions would be close in terms of results to that of Danny." - Roy H.
Firstly, the Celtics don't "switch everything." They do switch a lot. There are a few reasons teams in general, and the Celtics in particular, do this. Firstly, as teams run progressively more actions to generate open 3-pointers, other defenses can easily be exploited. Go under the screen and you give up an open 3. Fight through it and you expose yourself to shooters stopping on a dime, pulling up, and drawing a shooting fouls behind the arc. ICE is an option in some areas of the court, but it exposes you to pick-and-pop opportunities. Hedging can work sometimes, so can showing, or zoning up. While I disagree with your assessment that Boston does not "switch everything", as you said, what matters the most is the personnel involved in a pick and roll, for example, but who said anything about fouling a jump shooter, lol? That's just plain dumb. At the same time, however, I think it's important to recognize that it's really a case-by-case basis as opposed to a one-size-fits-all defensive approach. For example, when Lebron runs a pick and roll, never switch out unless you have a guy who can actually guard him effectively in such a scenario, just go under the pick and have your big guy contest while Lebron's defender boxes out the guy setting the pick to nullify the offensive rebounding advantage or whatever. I know that Lebron has improved as a shooter, but I'd rather give him a three than allow him to get to the rim any time he wants, break your defense down, and get other people better looks, never mind getting our guys in foul trouble. Obviously, such a strategy would not work against Curry, so you have to come up with another idea for when he runs that play with Green, most of the time to create a 4-on-3 advantage in the half court where Draymond mostly feeds guys for open threes, but I happen to think that there are more ways to play that action as opposed to the strategies you've outlined, although I'm probably wrong . But what matters is personnel. Switching is good when you have a lot of versatile defenders. That is what the Celtics had last year and also have this year. Hedging is good if you've got a really mobile big. They don't have that as much, as Horford isn't quite quick enough to relaibly do that in all matchups. IT also probably made it more desirable. If IT is guarding the ball handler, switching on the pick and roll will take him away from on-ball defense, which is optimal. So why not invest in one? To be fair, I'm not completely against switching someone's defensive assignment during, say, a playoff series, or at the end of the shot clock, perhaps, but I just don't see a point in expending so much effort on defense if the end result is invariably an offensive rebound . The Celtics do not switch everything, they had guys who fights over screens instead of switching, like marcus and ab. Well this is not surprising, seeing as this came from the guy who criticized PnR. Okay, but Bradley's defensive assignment was always switched to the opposing point guard from the get-go to cover for Thomas, and Smart would do the same thing whenever he was on the court with IT. Plus, we only have one of those kind of defenders left, now . Personally, I'm not a fan, as I believe that implementing this strategy can too easily be countered, creates too many mismatches with little to no effort, only further exacerbates our already pathetic rebounding performance, if that's even possible, and has also been heavily, and intelligently, exploited by Cleveland during every single one of our games against them over the last 2.5 seasons. Hey, I agree with you 100% on that one, except that Boston doesn't look to exploit that size advantage on da boards . Horford could be guarded by Curry or Thompson, for example, right under the basket as a shot is in the air and not even attempt to go for the rebound, as he'll just automatically turn tail and run back on defense. Ugh. I like my center to stay on his man so he can stay close to the basket for rim protection and defensive rebounding. A center should only switch late in the shot clock. I do like switching 1 through 4 but that depends on the defensive versatility of those players. Need big guards and mobile forwards. Without that versatility, it hurts more than it helps. I thought that it was pretty self-explanatory? Haven't you seen it during games and heard/seen references to "switchability"? I know you pay attention and are always in game threads . Thanks, but whil mimknow switchng, switching everything is not clear completely. That is whynimask d for more info. I swear, never did I think that Jay Bilas' "wingspan" would ever have a rival for inspiring drinking games, but here we are . On a more serious note, I don't agree with your view that Hayward and Nader can guard shooting guards. Granted, I haven't seen a ton of Gordo, but when he matched up against Kawhi Leonard on an ABC game last year, it was, well, embarrassing, to say the least. One step and Leonard just exploded to the basket for a dunk. Not good, and I'm not sure about Morris being able to stay with small forwards, either. He's the classic tweener, imo - too slow to guard 3s and not strong enough to defend 4s, but hopefully I'm wrong. Actually, out of all the guys on the roster as of right now (stay tuned ), I think that Semi might be the only guy who can defend at least some shooting guards given his quickness while also having the strength to muscle bigger players, but we'll see what happens. I don't even expect to see him on the court this year, aside from the preseason if I'm lucky. Sigh. Personally, I'd love to see him match up with Lebron. At least James won't be able to go through him, lol. I think. No idea about Not Channing and Anthony Bennett's french cousin, lol . Actually off the ball, as well. Yes, although they primarily switched 1-4 with Kareem rarely ever coming out of the paint except during the playoffs, and he actually had pretty good quickness through 86-87, imo. They played a match-up zone - illegal defense - for the entirety of Magic's career and were rarely cited for it because, well, they're the Lakers , mostly to cover for Magic, which is also why they often struggled to rebound against the Celtics and when/where the term "gang rebounding" was born (I think. Not sure about that one). Normally, and even before they'd routinely switch 1-4 during games, Byron Scott took the point guard, Worthy would defend either his matchup or even a shooting guard when they played the Pistons, Green would be on either his traditional assignment or sometimes the opposing small forward like Dantley when, again, Detroit and LA squared off, and Magic, somewhat like Bird, would take the weakest link, so to speak, not only to conserve energy but also be near the basket to get the fast break going, himself, after getting the rebound, and most of Riley's defensive assignments were also designed to put Magic, Scott, and Worthy in their best respective areas to thrive on the break (Magic in the middle with Worthy to his left and Byron to his right), which is why it was of paramount importance, and especially for a slower team - injured or not - like the Celtics, that you not align your offense in that very pattern, which, unfortunately, is exactly what Boston did, with one rare exception, from 83/84-87/88, as KC Jones never seemed to understand that he was engineering his own demise with that very formation *facepalm*. Jimmy Rodgers, on the other ha...never mind, I've written way too much, already, lol .